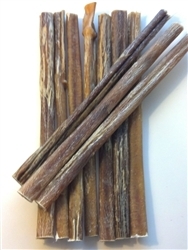 We have odor free bully sticks that are from USA cattle. Support made in USA and buy bully sticks that are coming from cattle here in the USA. They are dried and processed without any additives or preservatives- Only one ingredient-bull pizzle. These bully sticks are odorless because they have been vertically dried to remove any liquids or odors, thus an odor free bully stick. Our bully sticks are available as singles or in value packages of 10 and 25. Find made in USA pet supplies at Mickey's Pet Supplies. We are a family owned business that cares about our customers. We believe in the old-fashioned way of treating each and every one of pet parents as family. You can reach us anytime by e-mail or phone.